I have many bugbears. One of them is stuff that goes missing in the house. Especially when food gets taken from the fridge. I’m hoping the answer to this will be the Lockabox. The Lockabox is a product I stumbled across online. It’s a box that comes with a combination lock and allows you to lock things away. It fits neatly on a fridge shelf and means that I can now lock away any chocolate, drinks or goodies that seem to go missing when the kids are home. I was tempted to go for the see-through Lockabox if only to tease the kids with goodies that they couldn’t get their hands on. Instead, I chose the white version. It hides the contents of the box fairly well and keeps temptation at bay. Measuring 31 x 21 x 17 cm, the box is large enough to take up half a shelf of an average fridge. Although it can be used in It’s also big enough to house XBox Controllers, mobile phones and a Nintendo DS or two. It’s also a convenient place to stash away cash for safe keeping (pun intended), and even car keys if you’re worried about them being nabbed somehow. Part of me feels as though it’s overkill. After all, things shouldn’t go missing in a family house. But things do, and since having the Lockabox I’ve been able to safely keep track of the things that I don’t want to go missing. You can set the code to whatever three digit code you like, and it can be changed fairly easily (as long as you know the existing code). That means there are 1,000 different combinations that you can use. I’d definitely recommend it. If you don’t use it to keep things from wandering hands, you can use it to lock away electronic equipment if you think they’re being overused. Perhaps take it out of the fridge first! 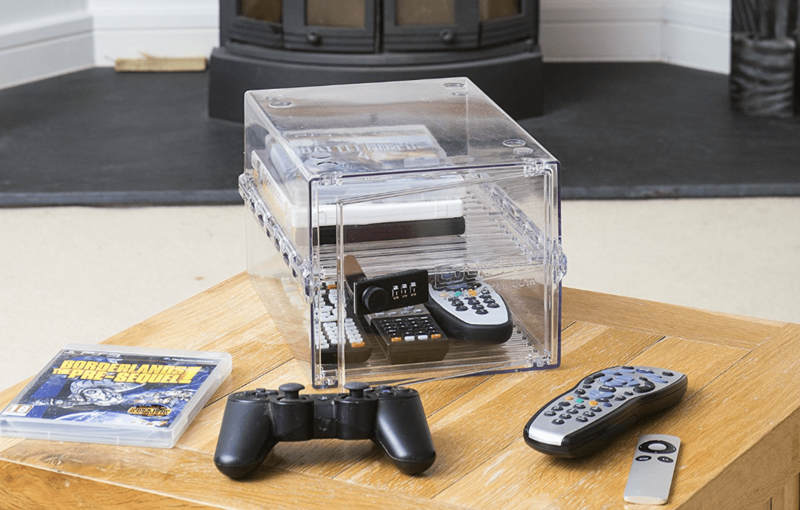 Buy the Lockabox at Amazon for just £29.99! I’ve never heard of this before, but it will be great for hiding my snacks from my greedy kids! Never had one but this would be great for snacks – my fiance will eat anything! But also seems good for any valuables – cash or jewellery for instance! What a marvelous idea! I have two hungry kids in the house who can’t keep their hands off anything that looks remotely edible! One even tried to eat my kiwi fruit face mask! Great Idea for those sharing a house! I’m lucky as I live with my kids and we don’t have to hide or lock up any food! 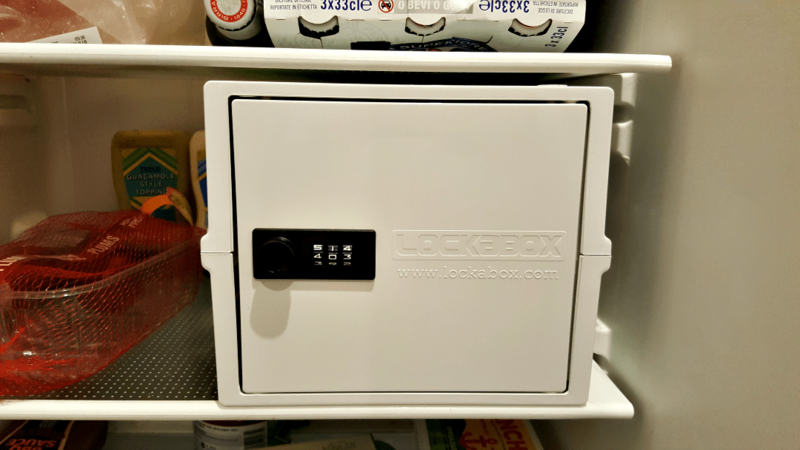 Never heard of Lockabox but could have done with it when my daughter was still at home. Things we had planned to eat for tea would be gobbled up on a whim. This looks real Cool. I would put things I would not want to lose or get damaged in it. Spare keys, old coins, etc. For protecting food from being consumed by others before your approval; this is fantastic. Like you, I would not get the see through box as that would lead to temptation and begging, resentment and dissappointment. lol. I cannot tell you how many times I bought something and looking forward to enjoying it only to find it already eaten. I haven’t heard of these, great idea, I would keep my chocolate and emergency stash of sweets in it! Seems handy, not seen these before. I’ve never heard of this product before but I like the look and sound of it. Never seen it before but Id hide my chocolate in it! Not heard of it before, but I think I would store my cheese in it. We have a lot of cheese theives in our house! Not something we would use, but maybe for students? I havent heard of this before, but there are so many things that I could use it for. I’d have to make the box a multi task box. I have never heard of this before but what a very good idea! I’ve not heard of Lockabox before. I’d hide my caramel wafers from my niece. I could have used this at one place I worked. Food was always disappearing. I’ve never heard of these, theyre great. The fridge one would be handy for when I don’t want my family to eat food I’m saving. This is the first time I’ve heard of this. It wood be great to keep my food from being stolen at work. I’d not bother to put food in it. If someone wanted the food that badly they’d smash it open. I’d probably put a few documents in there, nothing too private in case it got stolen as you’re not able to secure it to a wall I presume?